Need to put a project out to bid? International bidding conference calls are another area where our global conferencing service can make your communications job easier. Kuwait is one on the world’s largest oil producers and exporters, ranking in the top ten for both. Oil, by far, is Kuwait’s main export product, representing 95 percent of all of the nation’s exports. 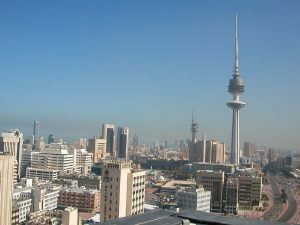 Businesses in Kuwait broker deals with various trade partners from around the world. Among Kuwait’s main export partners are countries such as South Korea, India, Japan, China, USA, United Arab Emirates, and Saudi Arabia. Whether you need to bring a handful of individuals together to negotiate a contract or plan on putting a project out to bid, one of the best tools available is the tried-and-true conference call. In this case, a global conference call. For example, let’s say we have a Kuwaiti oil producer who is dealing with a buyer in the United States who, in turn, operates oil refineries in China and Japan. As they’re working out the details of the transaction, they realize that it would be helpful to have representatives from each of the refineries contribute to the conversation. However, they also realize that hosting an international conference call isn’t quite as easy as hosting regular conference calls. Everyone is located in different time zones, so scheduling requires some coordination. In addition, how will each participant actually join the global conference call? While we can’t necessarily solve the time zone / scheduling problem, we can solve the logistics of bring a globally diverse group of people together into a Kuwait global conference call. With our global conferencing service, each attendee dials into the conference call using an access number specific to their home countries. For example, representatives from the refinery in China would dial a toll free or city-specific access number for China while those in Japan would dial a Japanese access number. The call’s host in the United States would dial a USA toll free number and could use the moderator dial out option to join the oil producer in Kuwait to the conference call. The options are plentiful and convenient for everyone involved. What if a key person was unable to join the Kuwait global conference call due to an illness or scheduling conflict? The conference call’s host has a variety of tools available including a call recording feature. With just a quick tap of a button in the free Connect app, the call can be recorded in MP3 format. Later, the moderator can make this recording available to the person who missed the conference call as it was happening. Need to put a project out to bid? International bidding conference calls are another area where our global conferencing service can make your communications job easier. Simply schedule your group audio conference for a specific date and time, using a universal time and date format like GMT, and invite bidders to join you from around the world. You may want to start out the conference in broadcast mode where only the speaker’s line is open and the later open the call up for questions and answers. Again, you can record the Kuwait global conference call and later distribute it to those who were unable to attend. Our global conferencing service accommodates up to 250 participants and features exceptional audio clarity. It’s also available on a pay-as-you-go basis, making it ideal for both your short-term and long-term global conferencing needs. The best way to experience the quality of our global conferencing service is to take it on a test drive. Contact us today to get a free trial of our Kuwait / global conference calling plan.